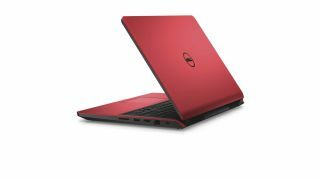 Dell announced a refresh of its Inspiron lineup at Computex 2015 with new laptops, a 2-in-1 hybrid, all-in-ones and desktops. Not only does the refresh touch on a diverse number of form factors in Dell's consumer computing family, but it also gives consumers choice with options for different CPU and GPU configurations. The new Inspiron notebooks include the Inspiron 5000 Series and Inspiron 15 7000 Series 2-in-1. For all-in-ones, Dell announced the Inspiron 20 and 24 3000 Series. Desktop users can choose from the Inspiron Desktop, Small Desktop or Micro Desktop. The Inspiron 5000 Series laptops come with 14-, 15-, and 17-inch screen options. Dell advertises "sharp high resolution displays, firm keyboards that are easy to type on for hours, exceptional battery life and great wireless performance" as key features of the 5000 Series. Dell is offering the 5000 Series with processor options from Intel and AMD. The notebooks are available in Beijing Red, Standard Black, Theoretical Gray, Alpine White and Sky Blue finishes. Unfortunately, to keep the cost of entry low, select features are a premium add-on in the 5000 Series, including backlit keyboard, touchscreen, precision touchpad and True Color to adjust the color temperature, vibrancy, tone and color clarity of the screen. Dell is selling the Inspiron 5000 14-inch for $599 (£391, AU$772), 15-inch for $449 (£293, AU$579) and 17-inch for $699 (£456, AU$901). Intel's Atom-based Braswell processors, based on an energy efficient 14nm design, will be coming in early-August to the 14- and 15-inch models in the series as well as the 14- and 15-inch in the Inspiron 3000 Series. The Inspiron 15 7000 Series 2-in-1 is a hybrid laptop with a 360-degree hinge that can fold back to convert between a regular notebook and a tablet form factor. With a forged aluminum body, nearly nine hours of advertised battery life, wide-angle IPS display, Waves MaxxAudio Pro audio software tuning, and backlit, spill-resistant keyboard, Dell is still able to keep the hybrid thin, measuring in at under 20mm (0.79 inches). The 2-in-1 has a starting cost of $549 (£358, AU$708) when it becomes available on June 23. The current 11-inch Inspiron 11 3000 Series 2-in-1 hybrid will be refreshed in August with an Intel Braswell processor. That model will start at $349 (£228, AU$271). Dell is making two screen sizes available in its new 3000 Series all-in-one desktop Inspiron PC. The Inspiron 20 3000 Series comes with a 19.5-inch HD+ display, while the Inspiron 24 3000 series is equipped with 23.8-inch FHD IPS display. The smaller model is available with an Intel Braswell CPU while the larger model comes with either AMD or Intel Braswell processor options. Highlights of the AIO include a slim design, edge-to-edge touchscreen, pop-up easel stand and single cord set up to give it a clean look on your desk or in your home. Users can also choose from either black or white color options. Gamers who want the Inspiron 3000 AIO experience can choose to add an AMD Radeon R-series GPU for stronger graphics performance. The 24-inch model will be available June 2 starting at $479 (£312, AU$617) while the smaller model has a starting cost of $329 (£215, AU$424). The Inspiron 20 3000 Series will be available in October in the US and in September in China. For those who prefer a desktop experience, Dell is offering a variety of PC form factors to fit your needs. The company announced an Inspiron Desktop tower, Inspiron Small Desktop and Inspiron Micro Desktop. Dell announced that the Inspiron Desktop will come with options for AMD and Intel processors as well as AMD and Nvidia graphics. The Inspiron Small Desktop is equipped with an Intel Braswell processor. The Inspiron Desktop and Small Desktop start at $279 (£182, AU$360) and both will be available in September. Dell's new Inspiron Micro Desktop competes in the same space as Apple's Mac Mini, measuring 5.16 x 5.16-inch (13.11 x 13.11cm). Dell says that the Micro Desktop is small enough to hold in one hand. The device can be configured with a dual-core Intel Celeron or quad-core Intel Pentium processor along with Intel HD integrated graphics. The Micro Desktop is available now for $180 (£117, AU$232). Consumers who need to extend their warranty or require additional help or technical support can purchase Dell's Premium Support package.